I was talking with some younger creators the other day about breaking in and I noticed that a lot of artists and writers tend to really only attack or pitch one company or even one editor at a time. And I had to stop for a second, take a deep breath, and say—WHAT ARE YOU THINKING?! And you know what? They answered. It seems that some creators think that if they talk with too many people then they’ll wind up screwing someone over if they’re offered two gigs. Well, I’m here to tell you as an editor, if I’m talking with you and eventually offer you a gig and you tell me, “I’m sorry, but I just got offered a gig with (fill in the blank here) and I accepted it,” then I am only MORE interested in hiring you later. I want to work with creators who are in demand around the industry. All editors do! And believe me, I totally respect and appreciate that you don’t want to pitch something to multiple places because it seems some how underhanded, but don’t be foolish. You’re nice and I like that, but you’ve got to make things happen. And if I’m too slow, that’s on me, not you. So if you’re talking with one editor—go find another! And another! And another! You can NEVER be talking with too many people. Always be networking! 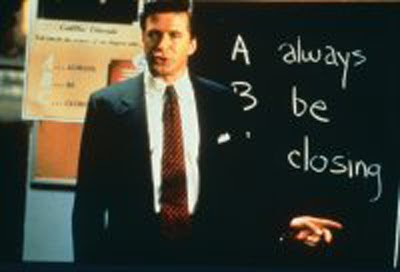 It’s like Alec Baldwin’s character in “Glengarry Glen Ross”—ABC: Always Be Closing. Only here it’s ABN: Always Be Networking! All that said, you can be upfront with folks and let them know you’re shopping your idea around or that you have other things in the pipeline, but that carries the risk of sounding like you’re trying to inflate yourself, so I’m not even sure you need to do that. But you can. I mean, it could inflate someone’s impression of you! Ha ha. So anyway, always be networking. Always be positive and upbeat. And you’ll get break in too!